Of the world Minecraft arrives this new version flash in which you will be able to carry out activities very similar to those of the real game. You must get resources to crate objects and get food to heal your health. Face the creepers you encounter on the road and other creatures that want to end your health. Beware of itching very often or you will run out of energy. Play this minecraft-style game on our website!. 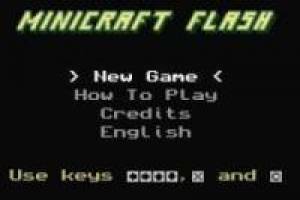 Enjoy the game Minecraft: Minicraft Flash, it's free, it's one of our minecraft games we've selected.